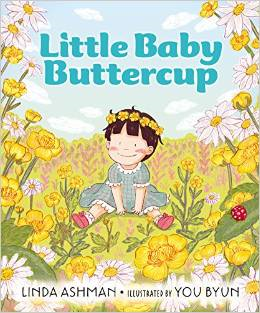 Little Baby Buttercup by Linda Ashman, illustrations by You Byun. Nancy Paulsen Books, an imprint of Penguin Group (USA) New York, NY, 2015. I was completely enchanted by Little Baby Buttercup. There are a whole array of books that portray a day in the life of a toddler and in that respect, Linda Ashman covers a wide range of typical activities: Mama cuddling her toddler girl; having breakfast (“Hand, mouth, cheek, hair–some to eat, some to wear.”); building and toppling blocks; playing with the dog and a visit to the park that includes a tumble, a bandage and a kiss. Where this story excels is the bittersweet tone. The jacket flap copy describes early childhood as “fleeting” and as the reader follows Buttercup through her day it’s apparent that this time — and these experiences will too soon evolve into different, growing up, experiences. I’ve been working on my own picture book manuscript and I’ve heard from editors that the ending of a good picture book must carry an emotional punch. The final illustrations of Buttercup show the little girl learning new skills. Mama’s final line will have grandparents, if not parents, choking up. When I was a young mother with two young children every day was busy to the fullest. I’m not sure I fully appreciated how fast time goes and how quickly these little ones grow up. Now, taking care of my granddaughter, I want to tell time to please stand still! Linda Ashman’s rhyming text, and You Byun’s playful illustrations of a toddler girl pack that emotional punch at the end of the story for this grandma. I, too, am lucky to be able to spend this fleeting time with a certain little girl.